Accessories can take a plain and boring outfit, and transform it into something that is so much greater. The accessory market can be quite turbulent, especially as so many new fashion designers try to release their own versions of the coming season’s “must have” bag. In recent seasons, there have been some really unique design developments, making the bag market even more interesting than usual. This summer, we can expect to see some pretty unique bags trending. From using unique materials, to unusual shapes and sizes, here are the summer bags that you need to have in your wardrobe this spring and summer season. This beaded bag is giving us serious retro vibes. It is definitely designed for those who are more “experimental” with their fashion choices. This bag is sure to be the standout piece in any summer ensemble, guaranteed to have people looking twice and throwing compliments to you left and right. It is unique, bold, and practical (considering you can pretty much pair it with a variety of different colors). Say what you want about fast fashion brands, but Zara always seems to be on top of the latest trends. This charming mini beaded bag is sure to make a great focal point in any outfit. Something like a simple black sundress can be elevated with a fun piece like this. The beads give the bag a nice texture and pattern, but the shape makes it even more fun. This 70’s inspired bag would be a great addition to your summer accessory collection. It looks like the thrift shop find of our dreams. Pair this bag with some flared, high waisted jeans and a crop top, or an easy summer dress, and you’ve got yourself a fabulous look guaranteed to rack up those compliments. Cult Gaia was founded in 2012 by designer Jasmin Larain, and has been focused on making beautiful heirloom pieces for its customers. Larain has come out with some very unique hand bag designs using unconventional materials. She designed the first Ark bag pictured above, an amazing piece for any summer wardrobe. It is made of Acrylic, so it will last a lifetime. 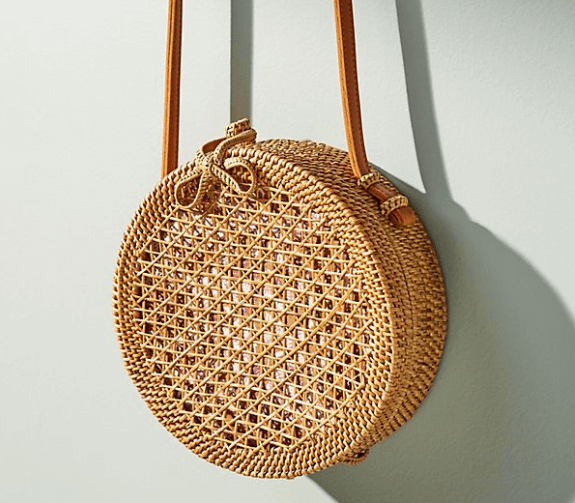 Rattan bags were everywhere last summer… and they seem to be making a reappearance in 2019. These bags are very cure and unique. They are handwoven in Bali, made of all natural materials with a genuine leather strap. A huge bonus is their neutral color, meaning they are worth the investment considering that they will match with pretty much anything. This model is available at Madewell. The Rattan round bag was a huge smash last season, and people are keeping the trend alive. There is something playful about having a circular bag, making it a fun accessory to add to your wardrobe. This particular bag from Anthropologie add a bit more playfulness to the unique design with a “peek-a-boo” cotton lining. This bag is the definition of upwards moving fashion (from the streets to the runways). Inspired by a simple net grocery bag, this accessory has become a must have. The Staud Net-Layered Bucket bag is made of high quality leather with suede lining and a nylon net exterior. The handles are rounded, a huge trend for handbags this season. This bag feel reminiscent of the Jane Birkin basket trend of the late 1960’s, so I guess it is safe to say that it is giving us amazing French New Wave vibes. You may have never heard of Lucite, but it is almost a guarantee that your grandmother has owned a Lucite bag at one point. This plastic material is making a major comeback, as are pretty much all things vintage. Lucite is great for handbag designs because it can really be cut into any shape that the designer chooses. These clutches with a round handle are a great example of the Lucite vintage revival. plastic really is fantastic. This bag by Cult Gaia really has it all. From tassels, to round handles, this is most definitely a statement piece. Designers are ditching some of the more “traditional” square handbag shapes and opting for more abstract and playful silhouettes. This bag feels inspired by the Art Nouveau period of the 1920’s, an expansion on the coin purses used by women of that era. You may recognize this tiny purse from the Instagrams of several celebrities and influencers such as Kim Kardashian or the Hadid sisters. The Jacquemus Le Chiquito bag is definitely starting a few conversations within the fashion community. Who new that a micro bag costing upwards of $500 would be the latest must have? It sure is not something anyone could have predicted, but many other brands are running with the idea and developing their own versions of the “mini bag”. Here is another fabulous Lucite bag, done in a more “miniature fashion”. This design is definitely not one that you see every day, from the cubic shape, to the big beaded handle, this bag is fun and absolutely unique. It might be tiny, but it will fit the essentials, and look amazing doing so. The mix of colors makes this piece look like it is made from solid Jade, but luckily, Lucite is lightweight and super easy to carry. The Pyramid bag by Saint Laurent is definitely for a very niche market. It’s small size and unusual shape probably makes it pretty unpractical. With that said, it is sure to grab some attention. The high quality, red patent leather would really stand out in any outfit. The classic YSL logo in gold is also sure to steal a few glances from fashion insiders. This bag comes at a high price (especially considering that you won’t be able to fit much in it), but designer is always an investment. Handbags are a chance for you to really have fun with your outfit, so don’t be afraid to experiment a little bit. There are so many interesting materials, colors, shapes, and sizes that are trending in the world of accessories. A good fashionista knows how to accessorize in a way that can make even the dullest of outfits look like they were torn right of the runway. A unique and trendy bag could have everyone wondering if you are the latest hot influencer or fashionista.